Our Cultural Arts Center has a dynamic curriculum that includes art, music, theater, ceramics and movement classes in an environment that fosters creativity and the discovery of a personal voice. Group outings to cultural venues, collaborations with other artists, and partnerships with like-minded organizations round out a program that focuses on self-expression and opportunities for community involvement. Our goal is to bring a love and understanding of the arts to people with disabilities while connecting them with the world outside our studio. 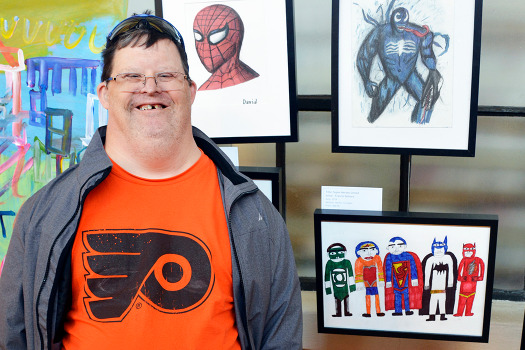 An internship at the Cultural Arts Center is a great way to make a difference in the lives of people with developmental disabilities while discovering how art therapy can positively affect the people and communities our program supports. Former Cultural Arts interns have come from Chestnut Hill College, Tyler School of Art, and Temple University’s Recreational Therapy programs.